, earl of Chatham, one of the most illustrious statesmen whom this country has produced, was the son of Robert Pitt, esq. of Boconnock in Cornwall, and grandson of Thomas Pitt, governor of Madras, who was purchaser of the celebrated diamond, afterwards called the Regent, The family was originally of Dorsetshire, where it had been long and respectably established. 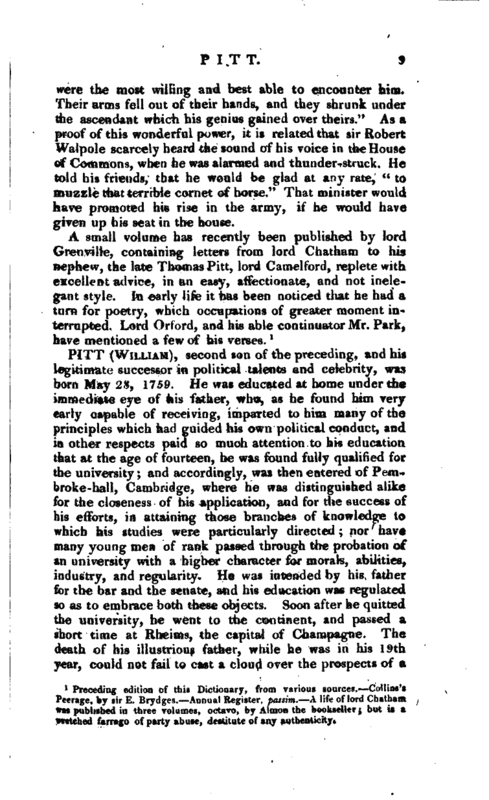 William Pitt was born Nov. 15, 1708, and educated at Eton; whence, in January 1726, he went as a gentleman-commoner to Trinity college, Oxford. It has been said, that he was not devoid of poetical talents, of which a few specimens have been produced but they do not amount to much, and of his Latin verses on the death of George the First, it is natural to suspect 'that the whole merit was not his own. When he quitted the university, Pitt was fora time in the army, and served as a cornet; but> his talents leading him more decisively to another field of action, he quitted -the life of a soldier for thatof a statesman, and became a member of parliament for the borough of Old Sarum, in February 1735. In this situation his abilities were soon distinguished, and he spoke with great eloquence against the Spanish convention in 1738. It was on the occasion of the bill for registring seamen in 1740, which he opposed as arbitrary and unjustifiable, that he is said to have made his celebrated reply to Mr. Horatio Walpole, who had attacked him on account of his youth (though then thirty-two), adding, that the discovery of truth is little promoted by pompous diction and theatrical emotion. 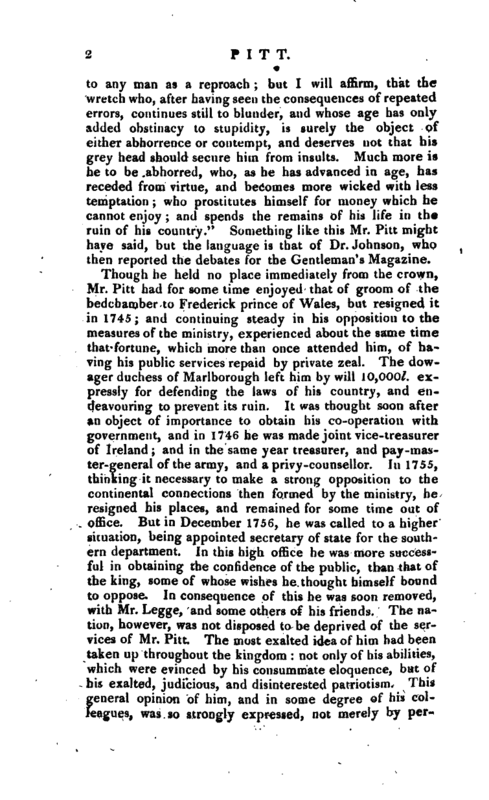 Mr. Pitt retorted, with great severity, “I will not undertake to determine whether youth can justly be imputed | to any man as a reproach; but I will affirm, that the wretch who, after having seen the consequences of repeated errors, continues still to blunder, and whose age has only added obstinacy to stupidity, is surely the object of either abhorrence or contempt, and deserves not that his grey head should secure him from insults. Much more is he to be abhorred, who, as he has advanced in age, has receded from virtue, and becomes more wicked with less temptation; who prostitutes himself for money which he cannot enjoy; and spends the remains of his life in the ruin of his country.” Something like this Mr. Pitt might have said, but the language is that of Dr. Johnson, who then reported the debates for the Gentleman’s Magazine. Though he held no place immediately from the crown, Mr. Pitt had for some time enjoyed that of groom of the bedchamber to Frederick prince of Wales, but resigned it in 1745; and continuing steady in his opposition to the measures of the ministry, experienced about the same time that fortune, which more than once attended him, of having his public services repaid by private zeal. The dowager duchess of Marlborough left him by will 10,000l. expressly for defending the laws of his country, and endeavouring to prevent its ruin. It was thought soon after an object of importance to obtain his co-operation with government, and in 1746 he was made joint vice-treasurer of Ireland; and in the same year treasurer, and pay-master-general of the army, and a privy-counsellor. In 1755, thinking it necessary to make a strong opposition to the continental connections then formed by the ministry, he resigned his places, and remained for some time out of office. But in December 1756, he was called to a higher situation, being appointed secretary of state for the southern department. In this high office he was more successful in obtaining the confidence of the public, than that of the king, some of whose wishes he thought himself bound to oppose. In consequence of this he was soon removed, with Mr. Legge, and some others of his friends. The nation, however, was not disposed to be deprived of the services of Mr. Pitt. The most exalted idea of him had been taken up throughout the kingdom not only of his abilities, which were evinced by his consummate eloquence, but of his exalted, judicious, and disinterested patriotism. This general opinion of him, and in some degree of his colleagues, was so strongly expressed, not merely by | personal honours conferred on them, but by addresses to the throne in their favour, that the king thought it prudent to restore them to their employments. On June 29, 1757, Mr. Pitt was again made secretary of state, and Mr. Legge chancellor of the exchequer, with other arrangements according to their wishes. Mr. Pitt was now considered as prime minister, and to the extraordinary ability of his measures, and the vjgour of his whole administration, is attributed the great change which quickly appeared in the state of public affairs. It was completely shewn how much the spirit of one man may animate a whole nation. The activity of the minister pervaded every department. His plans, which were ably conceived, were executed with the utmost promptitude; and the depression which had. arisen from torpor and ill success, was followed by exertion, triumph, and confidence. The whole fortune of the war was changed; in every quarter of the world we were triumphant; the boldest attempts were made by sea and land, and almost every attempt was fortunate. In America the French lost Quebec; in Africa their principal settlements" fell in the East-Indies their power was abridged, and in Europe their armies defeated; while their navy, their commerce, and their finances, were little less than ruined. Amidst this career of success king George the Second died, Oct. 25, 1760. His present majesty ascended the throne at a time when the policy of the French court had just succeeded in obtaining the co-operation of Spain. The family compact had been secretly concluded; and the English minister, indubitably informed of the hostile intentions of Spain, with his usual vigour of mind, had determined on striking the first blow, before the intended enemy should be fully prepared for action. 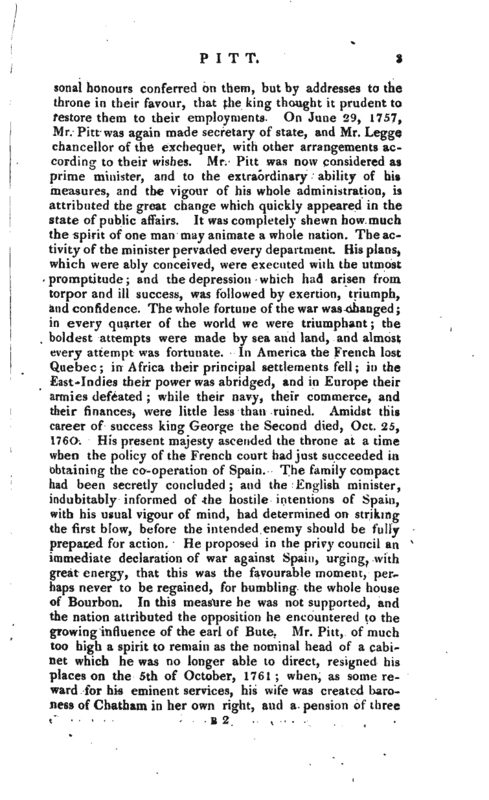 He proposed in the privy council an immediate declaration of war against Spain, urging, with great energy, that this was the favourable moment, perhaps never to be regained, for humbling the whole house of Bourbon. In this measure he was not supported, and the nation attributed the opposition he encountered to the growing influence of the earl of Bute. 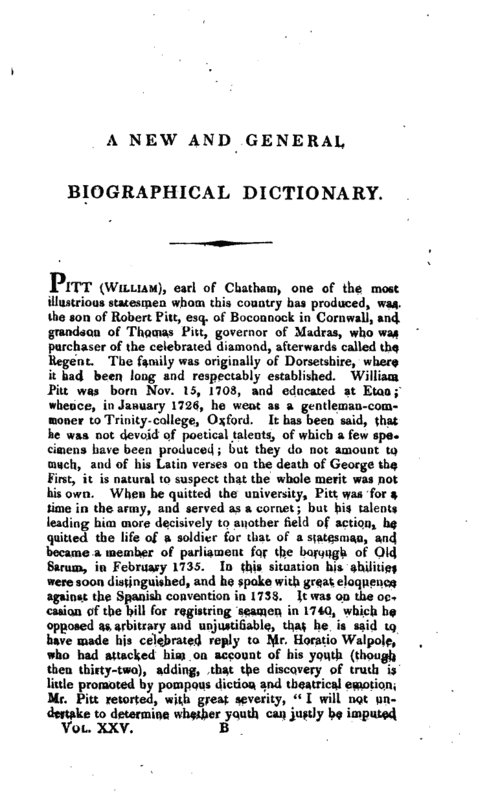 Mr. Pitt, of much too high a spirit to remain as the nominal head of a cabinet which he was no longer able to direct, resigned his places on the 5th of October, 1761; when, as some reward for his eminent services, his wife was created baroness of Chatham in her own right, and a pension of three | thousand pounds was settled on the lives of himself, his lady? and his eldest son. When the discontents in America began to appear, on the occasion of the stamp act, Mr. Pitt again found a subject for his exertions. The repeal of that act being proposed in March 1766, by the new ministry of the Rocking ­ham-party, Mr. Pitt, though not connected with them, | very forcibly supported the measure, which was carried; whether wisely or fortunately, is still a matter of dispute. About this time died sir William Pynsent, of Burton Pynsent, in Somersetshire, a man of considerable property, who, through mere admiration of Mr. Pitt in his public character, disinherited his own relations, and made him heir to the bulk of his estate. It was certainly a remarkable proof of the very uncommon estimation in which this statesman was held, that a circumstance of this nature should have happened to him at two different periods of his life. 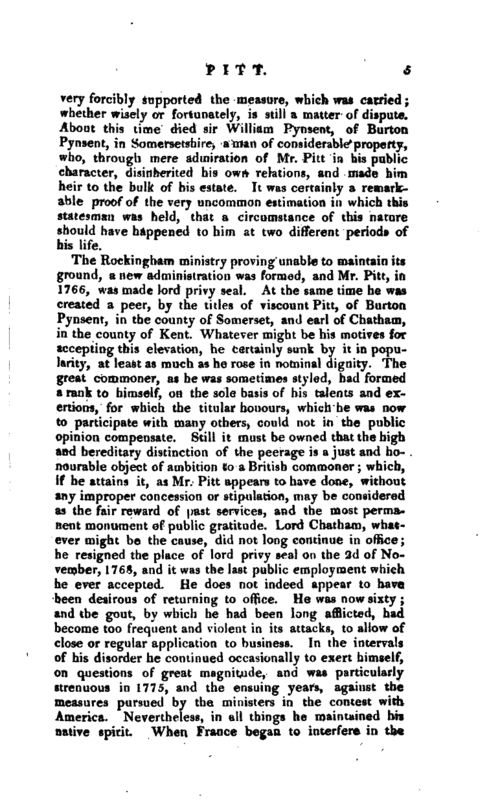 The Rockingham ministry proving unable to maintain its ground, a new administration was formed, and Mr. Pitt, in 1766, was made lord privy seal. At the same time he was created a peer, by the titles of viscount Pitt, of Burton Pynsent, in the county of Somerset, and earl of Chatham, in the county of Kent. Whatever might be his motives for accepting this elevation, he certainly sunk by it in popularity, at least as mu.ch as he rose in nominal, dignity. The great commoner, as he was sometimes styled, had formed a rank to himself, on the sole basis of his talents and exertions, for which the titular honours, which he was now to participate with many others, could not in the public opinion compensate. Still it must be owned that the high and hereditary distinction of the peerage is a just and honourable object of ambition to a British commoner; which, if he attains it, as Mr. Pitt appears to have done, without any improper concession or stipulation, may be considered as the fair reward of past services, and the most permanent monument of public gratitude. Lord Chatham, whatever might be the cause, did not long continue in office; he resigned the place of lord privy seal on the 2d of November, 1768, and it was the last public employment which he ever accepted. He does not indeed appear to have been desirous of returning to office. He was now sixty and the gout, by which he had been long afflicted, had become too frequent and violent in its attacks, to allow of close or regular application to business. In the intervals of his disorder he continued occasionally to exert himself, on questions of great magnitude, and was particularly strenuous in 1775, and the ensuing years, against the measures pursued by the ministers in the contest with America. Nevertheless, in all things he maintained his native spirit. When France began to interfere in the | contest, he fired with indignation at the insult and when, in 1778, it was thought necessary, after the repeated misfortunes of the war, to acknowledge the independence of America, he summoned up all the strength that remained within him, to pour out his disapprobation of a measure so inglorious. He did so in a speech of considerable energy, and being answered in the course of the debate by the duke of Richmond, seemed agitated with a desire to reply but when he attempted to rise, the effort proved too violent for his debilitated constitution, and he sunk, in a kind of fit, into the arms of those who were near him. This extraordinary scene of a great statesman, almost dying in the last exertion of his talents, has been perpetuated by the pencil, and will live for ever in the memory of his countrymen. He did not long survive this effort. 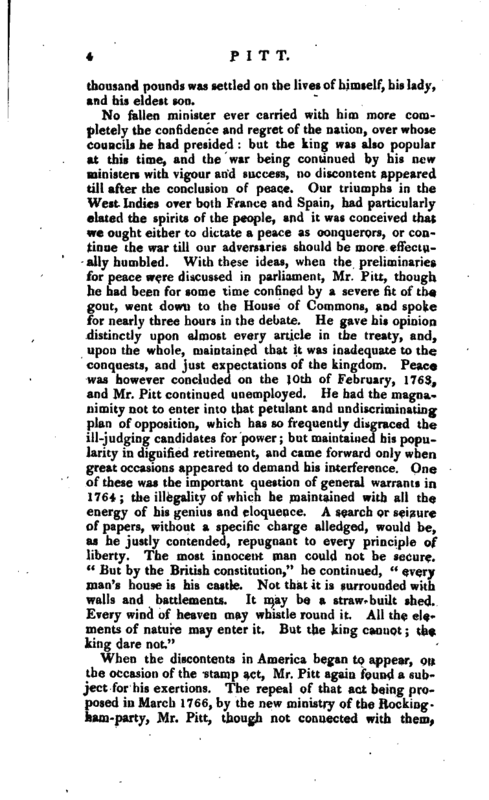 This debate happened on the 8th of April, 1778, and he died on the llth of May ensuing. 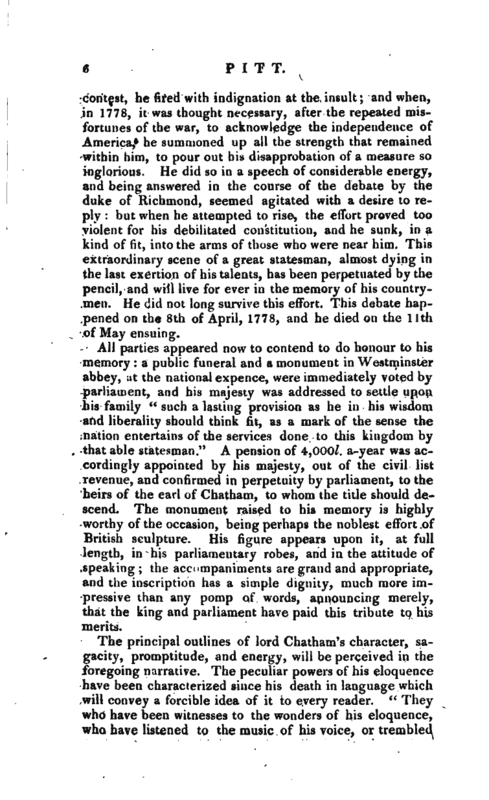 All parties appeared now to contend to do honour to his memory: a public funeral and a monument in Westminster abbey, at the national expence, were immediately voted by parliament, and his majesty was addressed to settle upon his family such a lasting provision as he in his wisdom and liberality should think fit, as a mark of the sense the nation entertains of the services done to this kingdom by that able statesman." A pension of 4,000l. a-year was accordingly appointed by his majesty, out of the civil list revenue, and confirmed in perpetuity by parliament, to the heirs of the earl of Chatham, to whom the title should descend. The monument raisedto his memory is highly worthy of the occasion, being perhaps the noblest effort of British sculpture. His figure appears upon it, at full length, in his parliamentary robes, and in the attitude of speaking the accompaniments are grand and appropriate, and the inscription has a simple dignity, much more impressive than any pomp of words, announcing merely, that the king and parliament have paid this tribute to his merits. The principal outlines of lord Chatham’s character, sagacity, promptitude, and energy, will be perceived in the foregoing narrative.- The peculiar powers of his eloquence have been characterized since his death in language which will convey a forcible idea of it to every reader. “They who have been witnesses to the wonders of his eloquence, who have listened to the music of his voice, or trembled | at its majesty; who have seen the persuasive gracefulness of his action, or have felt its force they who have caught the flame of eloquence from his, eye, who have rejoiced in the glories of his countenance, or shrunk from his frowns, will remember the resistless power with which he impressed conviction. But to those who have never seen or heard this accomplished orator, the utmost effort of imagination will be necessary, to form a just idea of that combination of excellence, which gave perfection to his eloquence. 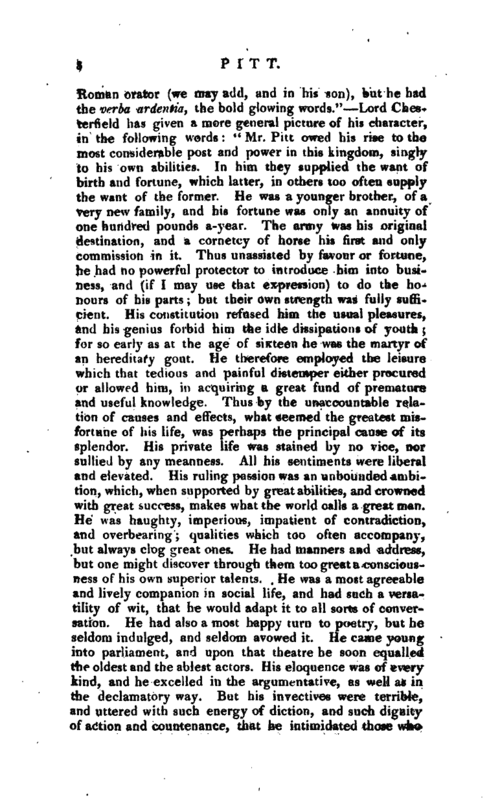 His elevated aspect, commanding the awe and mute attention of all who beheld him, while a certain grace in his manner, arising from a consciousness of the dignity of his situation, of the solemn scene in which he acted, as well as of his own exalted character, seemed to acknowledge and repay the respect which he received. This extraordinary personal dignity, supported on the basis of his well-earned fame, at once acquired to his opinions an assent, which is slowly given to the arguments of other men. His assertions rose into proof, his foresight became prophecy. No clue was necessary to the labyrinth illuminated by his genius. Truth came forth at his bidding, and realised the wish of the philosopher she was seen, and beloved.” We have omitted some parts of this spirited character because not written with equal judgment but the result of the whole is, that while he sought, with indefatigable diligence, the best and purest sources of political information, be had a mind which threw new lights upon every topic, and directed him with more certainty than any adventitious aid. 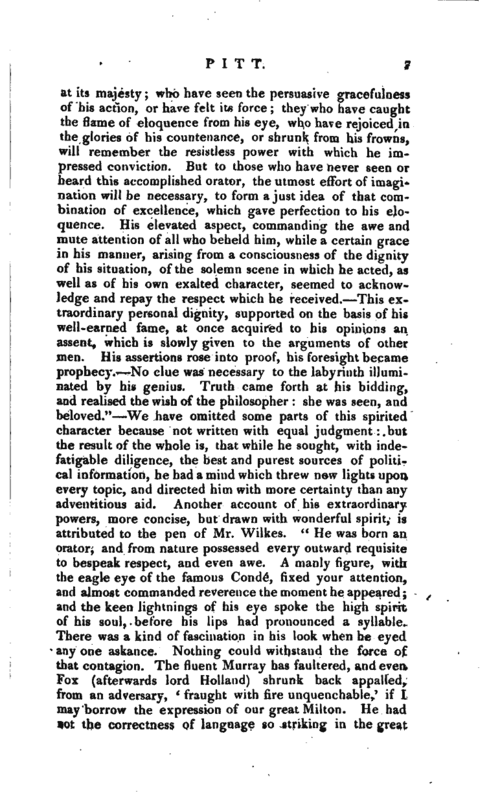 Another account of his extraordinary powers, more concise, but drawn with wonderful spirit, is attributed to the pen of Mr. Wilkes. “He was born an orator, and from nature possessed evtry outward requisite to bespeak respect, and even awe. A manly figure, with the eagle eye of the famous Conde, fixed your attention, and almost commanded reverence the moment he appeared; and the keen lightnings of his eye spoke the high spirit of his soul, before his lips had pronounced a syllable. There was a kind of fascination in his look when he eyed any one askance. Nothing could withstand the force of that contagion. The fluent Murray has faultered, and even Fox (afterwards lord Holland) shrunk back appalled, from an adversary, ‘ fraught with fire unquenchable,’ if I may borrow the expression of our great Milton. He had not the correctness of language so striking in the great | Roman orator (we may add, and in his son), but be had the verba ardentia, the bold glowing words.” Lord Chesterfield has given a more general picture of his character, in the following words: “Mr. Pitt owed his rise to the most considerable post and power in this kingdom, singly to his own abilities. In him they supplied the want of birth and fortune, which latter, in others too often supply the want of the former. He was a younger brother, of a very new family, and his fortune was only an annuity of one hundred pounds a-year. The army was his original destination, and a cornetcy of horse his first and only commission in it. Thus unassisted by favour or fortune, he had no powerful protector to introduce him into business, and (if I may use that expression) to do the honours of his parts; but their own strength was fully sufficient. His constitution refused him the usual pleasures, and his genius forbid him the idle dissipations of youth; for so early as at the age of sixteen he was the martyr of an hereditary gout. He therefore employed the leisure which that tedious and painful distemper either procured or allowed him, in acquiring a great fund of premature and useful knowledge. Thus by the unaccountable relation of causes and effects, what seemed the greatest misfortune of his life, was perhaps the principal cause of its splendor. His private life was stained by no vice, nor sullied by any meanness. All his sentiments were liberal and elevated. His ruling passion was an unbounded ambition, which, when supported by great abilities, and crowned with great success, makes what the world calls a great man. He was haughty, imperious, impatient of contradiction, and overbearing qualities which too often accompany, but always clog great ones. He had manners and address, but one might discover thrpugh them too great a consciousness of his own superior talents. He was a most agreeable and lively companion in social life, and had such a versatility of wit, that he would adapt it to all sorts of conversation. He had also a most happy turn to poetry, but he seldom indulged, and seldom avowed it. He came young into parliament, and upon that theatre he soon equalled the oldest and the ablest actors. His eloquence was of every kind, and he excelled in the argumentative, as well as in the declamatory way. But his invectives were terrible, and uttered with such energy of diction, and such dignity of action and countenance, that he intimidated those who | were the most willing and best able to encounter him. Their arms fell out of their hands, and they shrunk under the ascendant which his genius gained over theirs.” As a proof of this wonderful power, it is related that sir Robert Walpole scarcely heard the sound of his voice in the House of Commons, when he was alarmed and thunder-struck. He told his friends, that he would be glad at any rate, “to muzzle that terrible cornet of horse.” That minister would have promoted his rise in the army, if he would have given up his seat in the house. Preceding edition of this Dictionary, from various sources. Collins’s Peerage, by sir E. Brydges.-" Annual Register, passim. A life of lord Chatham was published in three volumes, octavo, by Almon the bookseller; but is a wretched farrago of party abuse, destitute of any authenticity.